There are BIG differences in the small details. GrubPack is the highest quality premium animal resistant wire mesh food bag available. GrubPack always cost LESS and always ships FREE! *GrubPack is made using industrial grade stainless steel wire mesh. Our field-tested mesh barrier STOPS mice, chipmunks, squirrels, raccoons, ravens, snakes and other small rodents, birds and reptiles. *A solidly embedded brass grommet is provided for securely hanging your GrubPack animal resistant bag out of reach of the critters. Our hefty grommet makes a big difference! *Our industrial sewing is done using heavy duty, outdoor rated, UV-resistant thread and belting. *We use only genuine Velco™ brand polyester closures. Polyester Velcro is UV-resistant, holds tight even when wet and works in temperature extremes of -70° to 200° Fahrenheit. *Our knitted stainless steel wire mesh allows the bag to expand and hold more! There are over 20 interlocking wire loops within the size of a dime! *GrubPack is the only company to offer four premium upgrade options! Improve your wilderness experience by customizing your GrubPack with genuine MultiCam camouflage belting, carrying handles, a convenient inner pouch or our double-security zipper. 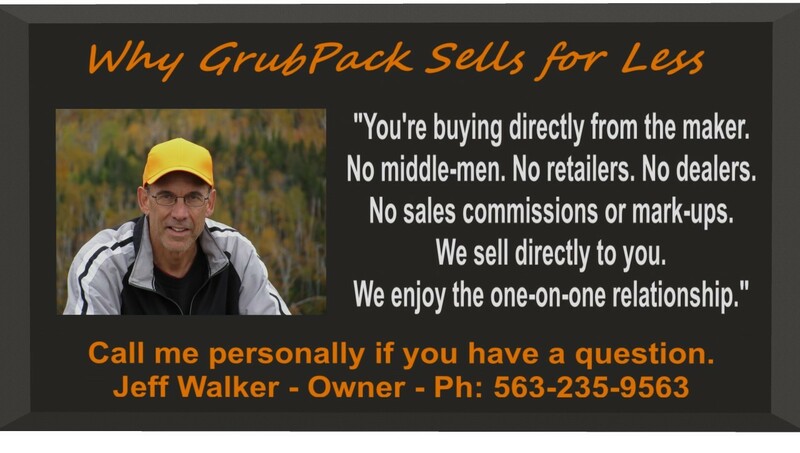 Go to "Upgrade Options"
*GrubPack is available in three colors and five convenient sizes at the best prices anywhere. Go to "Sizes and Prices"
*You buy direct from the manufacturer with GrubPack. There are NO retailers, NO middle-man mark-ups and NO sales commissions. We sell directly to you and include FREE shipping! You pay LESS. You get MORE. *You are fully protected by our 100% Guarantee. We stand behind our products and take real pride in providing great customer service before AND after every sale. We strive to earn and maintain your trust. Go to "100% Gaurantee"
*Every GrubPack is made in the USA! We support good paying American jobs! *Our facilities practice environmentally friendly waste management and recycling. We have instituded an energy saving lighting and consumption policy.